A fusion of rock and hypnotic Sufi music, Sufi Spirit is a warm, brilliant album to bask in from start to finish. As soon as Ejaz Sher Ali opens Sufi Spirit with his winding, rising voice, one thing is clear: this is no ordinary rock and roll album. The thumping bass that follows says it’s going to be more than just freeform mysticism, too. 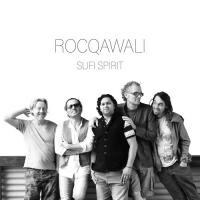 Based in Denmark, with members who have roots in Pakistan and Iran, Rocqawali mixes the traditional qawali style of Sufi devotional music with western rock to create entrancing jams with a spiritual lift on the group’s hypnotic debut album. Opening track "Ill Allah" sets a sublime tone, and though there are a few wince-worthy seconds of overprocessing on Ali’s voice early on, the rest of the song more than makes up for them, filling the track with light, love, and a drive that carries through the whole album. The momentum here is fierce, fed by not only voice and bass but by versatile drumming and dual guitarists, a quintet always in motion. The genre blend is no one-trick pony; while "Ill Allah" soars on cries of joy, "Ranjha" is a different kind of dizzying, a slow, smoldering spin aided by hand drums and quick guitar scales. The colors on "Kohi Jadu" are rich and deep, creating a slower, more velvety soundscape. It’s a starlit, 11-minute-long massage for the soul, moving in gentle, cleansing waves. Low-key though it is, the track is a highlight of the album. On "Alaap", the ecstasy is in full swing as the whole group improvises. Ali switches it up between legato and staccato in his wordless vocalizations, and guitars and synths go wild. It’s one of the album’s shorter songs, and one of the most unstructured, letting us feel the band’s raw and very substantial chemistry. Unquestionably the climax of the album, "Dhamaal" is an arrangement of the popular qawali typically known as "Dama Dam Mast Qalandar", a hymn famous throughout India and Pakistan, and here performed with the feverish energy it deserves and a cheerful bassline that anchors the rapid beats. It’s really the grand finale to the album; final track "Dil Mein" is a sweet, subdued denouement that serves as an extended epilogue. It’s a ghazal, a poem of unconditional and sacred love tinged with a hint of melancholy, and the song is beautiful for all its empty space. In fusing together rock and qawali, the members of Rocqawali show an immense amount of respect for both forms, for the grit and emotion that can explode from an electric guitar as well as for the complex melodies of rapturous, long-standing Sufi traditions. As different as each style’s origin may be, they are united in the universal purpose of music: expression. In that aim, the group is in total harmony, and they are palpably excited to reach that goal together, in a unity that takes them far. Rocqawali is a group in full bliss, and it’s infectious, especially in Ali’s masterfully controlled voice, letting his whole heart shine. Sufi Spirit is an album to bask in, warm and brilliant from start to finish.